21 months later, President Barack Obama releases military aid to Egypt that was suspended after the overthrow of Mohammed Morsi. President Barack Obama on Tuesday released military aid to Egypt that was suspended after the 2013 overthrow of the government, The Associated Press (AP) reports. The White House said that Obama notified Egyptian President Abdel-Fattah al-Sisi in a phone call Tuesday that the United States would be sending 12 F-16 fighter jets, 20 missiles and up to 125 tank kits, while continuing to request $1.3 billion in military assistance for Egypt. The White House said Egypt will remain the second-largest recipient of U.S. foreign military financing worldwide, according to AP. The funds were suspended 21 months ago when al-Sisi, then military chief, overthrew Islamist President Mohammed Morsi of the Muslim Brotherhood. Washington could not provide almost half of the annual aid package - along with assistance held up from previous years - until it certified advances by al-Sisi's government on democracy, human rights and rule of law or issued a declaration that such aid is in the interests of U.S. national security. The U.S. has been providing hundreds of millions in counterterrorism assistance to its ally, which didn't stall as a result of the government overthrow. Egypt has been arguing it needs the money to face growing threats from extremists creeping over the border from lawless Libya or operating in the Sinai Peninsula, and the U.S. sees the funds as critical for stability in the volatile Middle East. 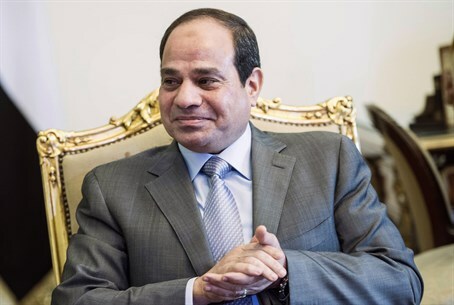 Al-Sisi recently appealed to the United States to play a greater role in helping his country fight terrorism, telling Fox News that while the U.S. has helped Egypt for decades, Egypt needs that help "more than ever," and wants to see a "big response from capable countries." White House spokeswoman Bernadette Meehan said on Tuesday the assistance will help address the growth of the Islamic State-affiliated Ansar Bayt Al-Maqdis, which has attacked Egyptian soldiers and civilians. The White House said it is not issuing a certification that Egypt has made progress toward democracy, noted AP. Instead, the U.S. said it is maintaining that the aid is in the interest of U.S. national security. The White House said Obama, during his call to al-Sisi, "explained that these and other steps will help refine our military assistance relationship so that it is better positioned to address the shared challenges to U.S. and Egyptian interests in an unstable region, consistent with the longstanding strategic partnership between our two countries."